“Pictures in Song” *&* in Sketch & Photo — “Hai-Kai” Lafferty, Robert C. (Bob). Scores of cheerful epigrams in hai-kai form and with sketches. New York: The Culture Press, 1929. 8vo. [4 (blank)], v–xi, [1 (blank)], 17–123, [13 (1 blank)] pp. ; illus.  Quirky, individual (and yet definitely “period”) epigrams, with equally individual illustrations both drawn and photographic. One of a series of books separately published over the course of a number of years; limited to 2000 “Litho-Manuscript-fac-simile” copies of which this is copy # 1117. Inscribed by the author on p. viii. “America Underfoot” Landreau, Anthony N. America underfoot: A history of floor coverings from colonial times to the present. Washington: Smithsonian Institution Traveling Exhibition Service, 1976. Small 4to. ix, [1 (blank)], 76, [2 (blank)] pp. ; illus. Anderson-Illustrated — A Lovely American Binding Langhorne, John. The fables of flora. New York: D. Longworth at the Shakspeare Gallery (pr. by L. Nichols), 1804. 12mo (15.7 cm, 6.2"). 70 pp. ; 11 plts., illus.  This is the first edition of these Fables to appear with American illustrator Alexander Anderson's wood engravings, following the title's original appearance in 1771; the flower-themed verses well represent a poet and translator whom the DNB identifies as “a popular writer in his day.” The volume is illustrated with 11 wood engravings and 11 copper engravings done by Anderson after designs by Thomas Stothart. The 22 illustrations are fit, charming, and LARGE on the pages. Hamilton notes that “in the sketch of Dr. Anderson's life written by himself in 1848 . . . [he] mentions by name only two books illustrated by him” — this, and the (dare we say here, “fabled”?) General History of Quadrupeds. Binding: American full calf binding of the first quarter of the 19th century, with a wide lacy gilt roll framing each cover and a narrower blind roll within that, the whole unobtrusively rebacked preserving the original, elaborately gilt-stamped spine. Provenance: Early 20th-century bookplate of Allen L. Story; most recently in the library of American collector Albert A. Howard, small booklabel (“AHA”) at rear. Selling Hair Tonic in Spain Lanman & Kemp. Tónico Oriental para el cabello. [Barcelona? ]: Lanman & Kemp, . 8vo. 4 pp. ; illus.  Spanish advertising leaflet for a hair product made by a New York drug company founded in 1808 and still in business today — a company which catered from its beginnings to a Hispanic clientele, once calling itself “The Spanish Druggists to the World.” This is an early advertisement for the product (when the company applied for the patent in 1884, they claimed to have been selling the product for just over 20 years), which is still available under the name Tricopherous (or Tricofero) Hair Tonic; this promotion says the tonic was prepared “en San Martin de Provensals, Barcelona.” All the testimonials given here are dated 1863 and 1864. The front page bears two vignettes of brunette beauties, one in the process of applying tonic and one with an impeccably arranged hairstyle. “One Hundred Illustrations” Larwood, Jacob, & John Camden Hotten. The history of signboards, from the earliest times to the present day... sixth edition. London: John Camden Hotten, 1867. 8vo (18.8 cm, 7.4"). Col. frontis., x, 536 pp. ; 19 plts. Click the interior images for enlargement.  Sixth edition (following its initial appearance in the previous year) of this engaging account, full of anecdotes, historical digressions, and literary quotations, as well as attempted analysis of emblems and their meanings (though this is not, of course, the classic “emblem book”). “One hundred illustrations in fac-simile” are attributed to Larwood on the title-page; the work features 19 plates, each depicting an assortment of house- and pub-signs, as well as a hand-colored frontispiece “Drawn by Experience . . . Engraved by Sorrow,” in which a cheerful gin-drinking lady rides her woebegone, care-laden husband. Provenance: Title-page stamped by a private collector: “Thomas Witherell Palmer, Log Cabin Park” (Detroit).  Contemporary half calf with marbled paper–covered sides, spine with gilt-stamped leather title-label and ornate gilt-stamped decorations within compartments; binding with light to moderate rubbing overall, with spine leather starting to show some cracking. All edges stained red. Delightful reading and looking, and a delightful copy. Breton Folk Literature Legacy — Music & Engraved Plates La Villemarqué, Théodore Hersart, Vicomte de; & Tom Taylor, trans. Ballads and songs of Brittany ... translated from the “Barsaz-Breiz” of Vicomte Hersart de la Villemarqué. London & Cambridge: Macmillan & Co. (pr. by Bradbury & Evans), 1865. 4to (21.4 cm, 8.4"). Frontis., xxii, , 239,  pp. ; 8 plts.  First English-language edition, in the first issue original binding: Ancient and traditional pieces from Brittany, many with sheet music provided in the appendix — “with some of the original melodies harmonized by Mrs. Tom Taylor.” Laura Wilson Taylor (née Barker) was a talented violinist and accomplished composer who supplied music for her husband's plays and other theatrical performances, and published a number of popular songs. The volume is illustrated with a frontispiece and eight engraved plates done by several different hands after artists including Tissot, Millais, Tenniel, Keene and others, with the frontispiece and title-page vignettes being particularly nice steel engravings done by Charles Henry Jeens from Tissot designs. “The Vitality of Fictionalized Autobiography” Lawrence, D.H.; Sheila Robinson, illus. ; Robert Gorham Davis, intro. Sons and lovers. Avon, CT: The Limited Editions Club, 1975. 8vo (27.2 cm, 10.7"). x, , 443,  pp. ; 12 col. plts. ; illus.  Limited Editions Club printing of Lawrence's first major success, a controversial version of his early life as a young artist whose allegiance shifts between his mother, a spiritual girlfriend, and a sensual married woman. The work appears here with an introduction by Robert Gorham Davis and strongly executed collage-block illustrations (12 color plates and 16 black-and-white drawings) done by Nottingham native Sheila Robinson. The volume was designed by Bert Clarke and printed by A. Colish in monotype Bembo on Strathmore eggshell rag paper. This is numbered copy 733 of 2000 printed, and was signed by the artist at the colophon. The monthly newsletter and prospectus are laid in. Binding: Bound by the Tapley-Rutter Co. in full natural homespun Irish linen; cream paper label printed in navy and red on the spine. A Mathematician, a Missionary, & the Chinese Rites Controversy Le Comte, Louis. Memoirs and observations topographical, physical, mathematical, mechanical, natural, civil, and ecclesiastical. Made in a late journey through the Empire of China, and published in several letters. Particularly upon the Chinese pottery and varnishing; the silk and other manufactures; the pearl fishing; the history of plants and animals. Description of their cities and publick works; number of people, their language, manners and commerce; their habits, oeconomy, and government. The philosophy of Confucius. The state of Christianity, with many other curious and useful remarks. London: Pr. for Benj. Toke & Sam. Buckley, 1697. 8vo (20 cm; 8"). ff., 527 [i.e., 543],  pp. ; frontis. (port. ), 3 plt. (2 fold. ), fold. table.  In the annals of early Westerners writing about China, the members of the Society of Jesus rank high for the quantity and quality of their writings. Louis Le Comte (1655–1728) began his novitiate in October 1671, was sent to China as a mathematician and a member of the 1687 Jesuit mission under the leadership of Jean de Fontaney, and returned to Europe in 1691. In 1696 he published his Nouveaux mémoires sur l'état présent de la Chine: It caused great debate within the Chinese Rites Controversy. This is the first edition of the English translation of that work. It begins with an engraved frontispiece portrait of Emperor Cam-hy [i.e., K'ang-hsi] signed “M. Vander Gucht sculp.” The other plates depict “The throne of the emperor of China” (folding), “Outom-Chu, a tree in China,” “The observatory at Pekin” (folding), and a folding table of “All the words that form the Chinese tongue” (!!). The work is a classic in the field of early European accounts of China, of missions to and in China, and of travel in general. Thomas Jefferson owned a copy of this edition and may have done so for the work's sections on education in that kingdom. Provenance: Signature of M. Middleton dated 1699 at top of the frontispiece. Later in the collection of the Pacific School of Religion (properly released). (“Entitled” Little Pipsqueaks Are the Laughingstocks) Leech, John, illus. The rising generation. A series of twelve drawings on stone. London: The Punch Office (pr. by Bradbury & Evans), . Folio (38.6 cm, 15.25"). 12 col. plts.  First edition: Twelve hand-colored large lithographs from the famed Victorian caricaturist and illustrator, depicting a series of precocious young boys ridiculously wooing or just ogling young ladies and grown women, sighing about Shakespeare being terribly overrated, requesting that the claret be passed their way, declining quadrille requests in supremely world-weary fashion, etc. 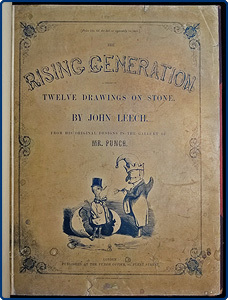 Dickens (whose Christmas Carol and several other works were illustrated by Leech) himself lauded the images and their appearance in book form: “These are not stray crumbs that have fallen from Mr. Punch's well-provided table, but a careful reproduction by Mr. Leech, in a very graceful and cheerful manner, of one of his best series of designs . . . [which] shows to infinitely greater advantage in the present enlarged and separate form of publication” (Old Lamps for New Ones, 1850). The original wrappers are mounted and bound in. This engaging production is now uncommon: WorldCat finds only nine U.S. libraries reporting ownership, and copies are seldom seen on the market. Robin Is to the Greenwood Gone Lees, Jim, ed. ; David Gentleman, illus. The ballads of Robin Hood. Cambridge: Printed for the members of the Limited Editions Club, 1977. 4to (27.9 cm, 11"). Frontis., xxiii, , 206,  pp. ; 7 plts., illus.  Old ballads of the beloved outlaw of Sherwood presented by the Limited Editions Club, edited and introduced by Jim Lees, and illustrated with numerous line drawings and eight full-page color autolithographs by David Gentleman. The text was set in Poliphilus and Blado italics and printed on Dickinson's Evensyde Offset paper at the Cambridge University Press, following John Dreyfus's design. This is numbered copy 1063 of 1600 printed, signed by the artist at the colophon. Binding: Quarter green buckram and cream paper printed in dark gray in a foliage-inspired pattern, spine gilt-stamped with title and vignettes. “L’homme fossile en Europe” Le Hon, Henri Sébastien. L’homme fossile en Europe son industrie, ses moeurs, ses oeuvres d’art ... cinquième édition avec une notice biographique .... Paris: J. Baudry, 1878. 8vo (22.5 cm, 8.9"). Frontis., viii, 487,  pp. ; 3 plts.  Fifth edition, following the first of 1848, with added paleontological and archeological notes by M.E. DuPont. This study of prehistoric peoples was written by a military man and artist who specialized in maritime painting before becoming interested in natural history, astronomy, and geology; the work is illustrated with a chromolithographic frontispiece, three tinted lithographic plates, and numerous in-text wood engravings. “Gay Images & Bright Colours” — “The Most Archaistic Parts of the Country” Lepage-Medvey, E. French costumes. London, Paris, New York: The Hyperion Press, 1939. Folio (32.5 cm, 12.75"). , 7–23,  pp. ; 40 col. plts.  An array of 40 crisply rendered, brightly colored lithographic prints of picturesque French regional folkloric garb, with a preface by André Varagnac. The text was translated into English by Mary Chamot. Illustrated Admiration Life of General Scott. [New York? : 1852?]. 8vo. 32 pp. Celebrating 250 Fine Books Limited Editions Club. Quarto-Millenary: The first 250 publications and the first 25 years 1929–1954 of the Limited Editions Club. New York: The Limited Editions Club, 1959. Folio (31.6 cm, 12.45"). xiii, , 295,  pp. ; illus.  First edition of a marvelous tribute to the accomplishments of the Limited Editions Club, including a bibliography and essays by Paul Beaujon, Paul A. Bennett, Edward Alden Jewell, James Laver, Thomas Craven, and John T. Wenterich. The rest of the volume is dedicated to reproductions of various title-pages, text pages, illustrated pages, full-page illustrations, and bindings, showcasing the wide range of techniques and aesthetics used by the artisans who produced the Club's publications. Robert L. Dothard designed the volume, which was printed on specially made Curtis Archer white paper and bound by Frank D. Fortney of the Russell-Rutter Co. This is numbered copy 1557 of 2250 printed, one of the 750 copies intended for institutional and professional distribution outside the Club. Provenance: Laid in is a promotional letter from the Club addressed to Leonard F. Bahr, proprietor of the Adagio Press; the original, unused subscription form and envelope are also present. Famous London Town” London cries for children. Philadelphia: Johnson & Warner (pr. by John Bouvier), 1810. 24mo (14 cm, 5.5"). Frontis. (incl. in pagination), 40 pp. ; illus. Interesting Reading & Interesting Illustration Long, George. The British Museum: Egyptian antiquities. London: Charles Knight, 1832–36. 12mo. 2 vols. I: viii, 399, [1 (errata)] pp., [1 (ads)] f. II: viii, 488 pp.  An very informative account of the museum's holdings as of the first third of the 19th century, highly illustrated with wood engravings that are sometimes full-page, mostly in-text. The Classic Pilgrim Love Triangle Longfellow, Henry Wadsworth. The courtship of Miles Standish. Chicago: M.A. Donohue & Co., [ca. 1910–20?]. 8vo. , 152,  pp. ; 12 plts.  Attractive illustrated edition of this enduringly popular poem, followed by assorted shorter Longfellow pieces. In addition to the frontispiece reproduction of a painting of the pilgrims landing at Plymouth and the 11 plates illustrating the title piece, the pages are also decorated with liberally sprinkled in-text wood and steel engravings done by a variety of hands. Binding: Publisher's tan cloth, front cover and spine elegantly stamped in gilt, cream, and black, front cover with central medallion bearing ship (surely the Mayflower) vignette. Five Icelandic Stories — A Handsome & Thoughtful Production from the PENMAEN PRESS Lowe, Pardee, Jr. King Harald and the Icelanders. [Lincoln, MA]: Penmaen Press, © 1979. 8vo (24.3 cm, 9.6"). 43,  pp. ; illus.  First edition, and the first appearance in English of two of these tales: Five stories translated from the Icelandic by Pardee Lowe, Jr., and illustrated with wood engravings by Michael McCurdy, who was also responsible for the typography. The text was set in Palatino and printed on Mohawk Superfine paper by McCurdy and Penelope Reid; the binding was designed by Robert Hauser. This is numbered copy 28 out of the 100-copy deluxe edition, signed at the colophon by the translator and artist.